This is huge. Much bigger than it looks in the pictures. I think it must have the biggest wheels of anything in the Corgi range. This is a marvellous model with many features that work. The front wheels have realistic steering and there are controls to hold or release the missile, to move it horizontally and to raise the section of the vehicle so that the missile is perpendicular and in position for location with the Launch Ramp. (That was available as 1124 or would have been bought with another missile in 1112). 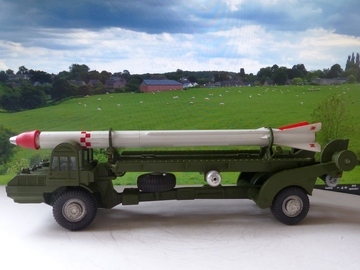 This is in really beautiful condition with really lovely paintwork on the vehicle and the missile too. The missile has had a replacement nose cone, cut back to enable the metal tip to be refitted. Later types like this had a ‘cap firing’ head. Early ones had just the rubber cone. Very few of these were sold and it is a scarce item now, particularly in this condition and with a good original box too. The mechanism does work but some support is needed to raise the missile through 90 degrees. It will stay in position, however, and there is no obvious damage anywhere, just slightly loose gears now.